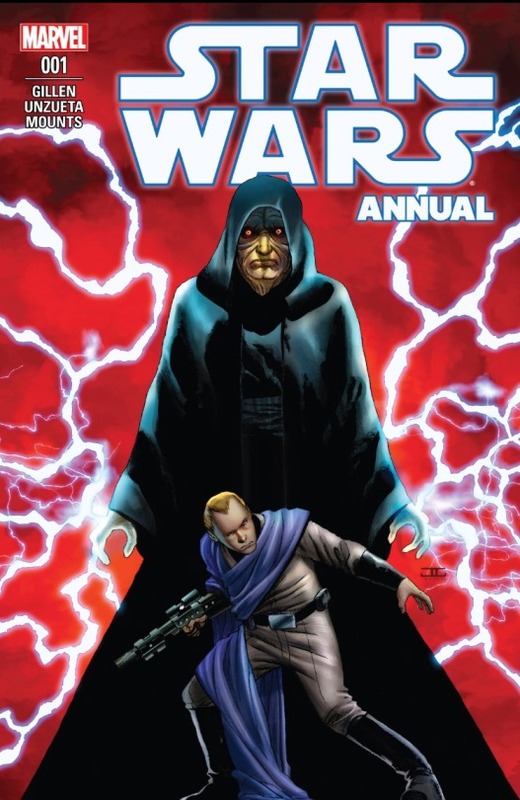 The first annual issue for Marvel’s Star Wars line introduces a new character to the Star Wars Expanded Universe, Eneb Ray, among other spies on Coruscant, and then promptly wipes them out (the spies, not Ray), in a story set to portray the duplicitous nature of Emperor Palpatine via a failed assassination attempt. It’s also much more enjoyable than it should be at first blush. Written by Kieron Gillen, taking time off from his great run on the Darth Vader run, and with art by Angel Unzueta , the Star Wars Annual takes place in the time period following the destruction of the first Death Star. Narrated by Eneb Ray, we meet this new character working undercover as an Imperial agent, when he receives an urgent message from our favorite Rebel Alliance leader, Leia Organa. In retaliation for the destruction of the ultimate terror weapon, the Emperor had gathered the anti-Imperialist Senators (who didn’t leave Coruscant quickly enough after the Senate was dissolved, apparently) with the intention of executing them. Leia needs Ray to rescue them. Reluctantly, our rebel spy agrees. Eneb successfully infiltrates the great round tower which serves as the prison, ascending its exterior in a manner that would make Spider-Man proud, only to discover a surprise upon reaching the imprisoned senators. The Emperor is coming to the tower to witness the executions and the Rebel Alliance has the opportunity to take him out. Among the imperial officers Ray captures in the process of reaching the senators is another rebel spy, and with her help, he contacts Leia and informs her of this once in a lifetime chance. It’s a risky plan which involves every rebel spy on Coruscant and a long shot, but as Ray reminds her, so was the attack on the Death Star. The princess agrees. The Emperor arrives as inspected and orders the senators to be brought to an audience chamber, where they rise up on a podium, hooded and supposedly bound. Despite being surrounded by the crimson Imperial Guard and Stormtroopers, the rebels make their move, revealing themselves to be the hooded senators. They number seven, representing the entirety of the rebel spy network on the Empire’s capital planet and the fight is brief as the Emperor’s troops are overcome. The Emperor, despite the surprise, makes a show of that wonderful optimism from Return of the Jedi, the type where he believed he’d won up to the moment his most trusted lieutenant picks him up and tosses him over the railing type of optimism, and makes a dash for the rooftop of the tower. Ray pursues, catches, and with a classic 1980’s action movie line, “With the compliments of Alderaan, my Emperor,” dispatches the greatest evil to visit the galaxy in the last couple generations. Except, as we all know, it’s impossible that he successfully kills the Emperor in a story set before The Empire Strikes Back, or any storyline for that matter. Before Ray can appreciate and savor the moment of victory, the real Emperor appears in a shuttle hovering over the roof top, lamenting the loss of a good body double. Eneb overcomes the shock of this revelation and makes a daring attempt to take down the right Palpatine, leaping from the tower to the shuttle and peppering the Emperor with multiple blasts from his weapon. The Emperor handily blocks the blaster bolts with a upraised palm and delightfully instructs Ray to look back behind him. Below, the security tower explodes in flames, killing Ray’s fellow spies, the senators, and everyone else still remaining within it. 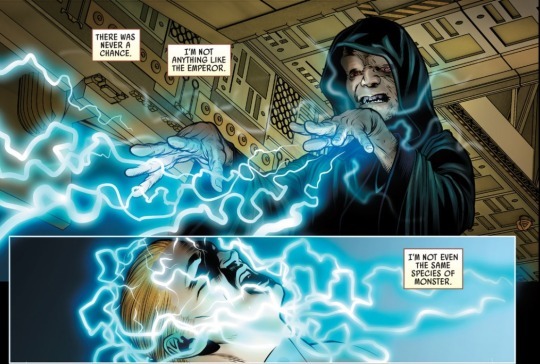 Before Ray can absorb the magnitude of the Emperor’s plan, Palpatine unleashes a wave of Force lightning against him, sending him plummeting from the shuttle to a presumed death. Despite the shock, Ray manages to save himself, but his mission is a complete failure and his cover blown. The annual concludes with Ray leaving Coruscant behind in search for a new way to serve the rebellion. 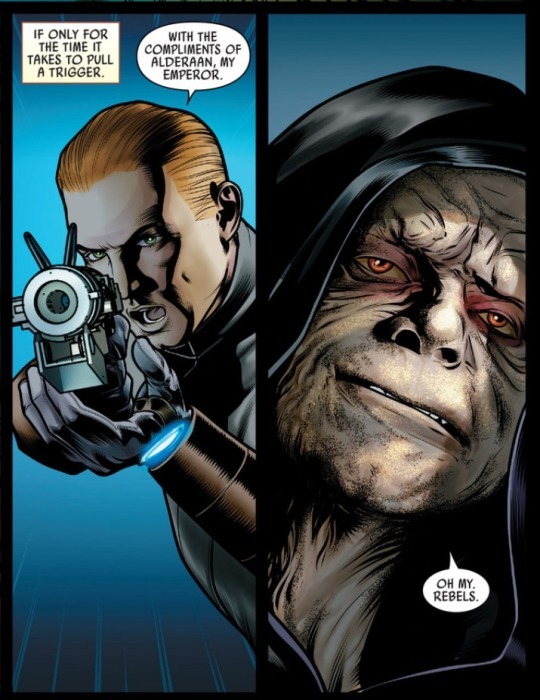 The Star Wars Annual takes a plot, the assassination of Emperor Palpatine, and makes it one we still find ourselves invested in despite that hard canon-bound fact that we know it cannot be successful. Part of this success boils down to the characterization of Eneb Ray, who believes himself from the outset to be a realist who’s willing to perform the darker deeds necessary to achieve success for the rebellion. 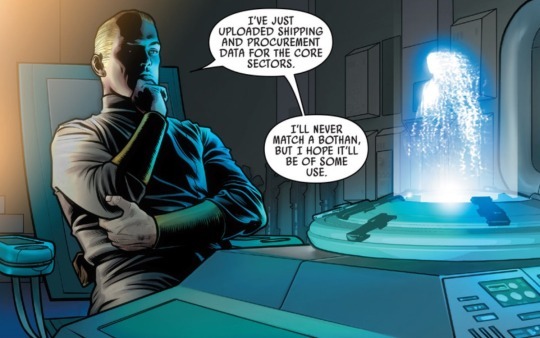 By the conclusion, however, after the success of another plan, the Emperor’s trap and Palpatine’s willingness to kill simply for propaganda purposes, Ray realizes that he’s not nearly as ready to do whatever it takes. Unzueta’s art is another part of the recipe, keeping the story fresh and visually engaging every step of the way. The result is a fun one shot story which brings us a new and fascinating character to the Star Wars universe, one we will look forward to seeing again in the future.